*See letter of congratulation dated 26th September 1766 from Pierre Thellusson of London (ancestor of the Lords Rendlesham) to Barthelemy Galiffe, on the occasion of the latter's marriage with his niece Marie Naville de Thellusson, in 'D'un siècle a l'autre' Vol. I, pages 134 - 135. These variations in which the type is always the same can be explained by the traditions, the memoirs, and the arms of the family. 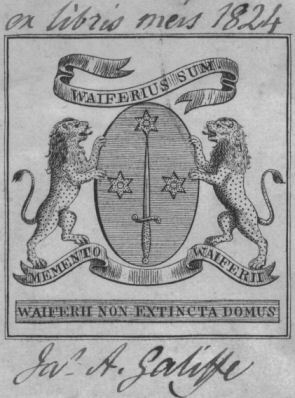 According to them, the name Galiffre or Galiffe is derived from the 'Romand' or old French 'Waifre' or Gaifre (Waiferius, Guaiferius) which is a frequent patronymic appellation found only in two dynastic Houses and their descendants, viz. : in the VIIth to the IXth century among the first Dukes of Gascony and Aquitaine, and from the IXth to the XIth century among the 'Lombard' princes of Salerne. The Genevese name is not the only one in which this occurs, for it is from the same type that better known names are derived, such as in Italy - Galferi, Alferi Ferino (diminutive of Guaiferio), Gaiferi, Galiferi, Galieffi, Gaglioffi, Galufrio, etc., etc. ; north of the Alps, Gaifier; in Spain Gaiferos, Gallafroy, etc., all names corresponding literally to variations of the Genevese name. Other families claiming the same origin, derive their names from other patronymic appellations used by the above princely Houses, viz. the Guaimari, Hunoldi, Azzoni, Ghisolfi, and Trasmondi, in Italy, and Hunaut, Lupe, etc; in the South of France. It is a well known fact that many old Italian families, even in some of the smallest Republics, can trace their origin by authentic documents to the XIth and even to the Xth century. Several of them claimed from their traditions a Roman origin. For instance the above named families descended from the 'gens' of the Sulpician 'Gallus' which survived the fall of the Roman Empire for several centuries in Lower Italy and is Southern Gallia. Other names of the same type, if not of the same traditional origin, existed long ago and belonged to individuals of widely different social positions. For instance we find in Burgundy, in the XIII and XIVth century, a noble family named Galafin. The property of a 'Gueyfu' of Cholex, is mentioned in a receipt granted by the Chapter of Geneva in 1537. The name of Antoine Alferio appears as a witness to a Deed regarding a house which Aymonet Asinari and Francois de Medecis, Lombards (Bankers) obtained from the Eveche de Geneve. A document from the commissaire of St. Victor, Geneva, dated 1429 mentions Jean and Antoine Gallifiuz of Passeyrier. Messire Antoine Veferacti is named as one of the clergy of the Diocese in 1451. Fgrege Antoine Gaiffier, Notary, is appointed as Attorney by Louise de Savoie, wife of Francois de Luxemburg Viscount of Martigues (1494). Nicolas, son of Pierre Veyfre (Petri veifri) of Faverges, residing in the parish of Ste Croix, Geneva, was received Bourgeois of Geneva on 10th January 1511 for eight florins. Philibert Galliffe (Philbertus Gallifu) is among the heads of families appointed on 22nd June 1520 to the 'Council of 50'. (The Christian name is apparently wrong, as there were at the time in Geneva only two men, father and son, Pierre and Francois Galliffe, qualified to sit in the Council) - On 20th February 1571, Donna Louise, widow of Cesar Galiffe, of Raconis in Piedmont, rents a room and outhouse from Sire Amied Mestrezat. On 21st November 1585 the baptism is registered of Theodore, son of Pierre Galiffe, Spaniard, and Lavinie his wife (there is near Barcelona a hamlet called Galliffa). Maitre Pierre Galliffard signs in 1637 as 'Chatelain de Sotenod and Vauromey', and 'notaire tabellion royal du Bugey'. Further on, it will be seen that the Galiffes of Dauphine prove that the name had already taken that French form (Galifii, in Latin) during the XIVth century, as well as the de Galliet or Galifet of Dauphine, Savoy and Provence. Grillet in his 'Dictionnaire' historique, III, page 13, mentions that family as having still in his time, representatives in Maurienne. Traditions have been so much abused in Genealogy that it is almost ridiculous to refer to them, perhaps in Geneva more than anywhere else, unless certain proofs exist to corroborate them and unless the legends are not at variance with authenticated facts. 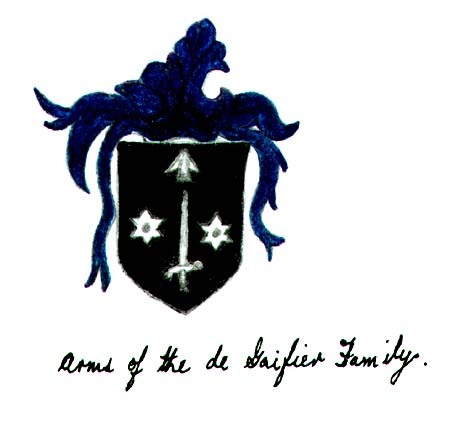 This particular family however is traced for centuries, from father to son, and it is so well known to contemporaries of each generation that it would be affectation to ignore these traditions, especially as besides the arms of the family, and the verbal legend referred to, its antiquity is proved by at one least positive document. (Notice sur la vie et les Travaux de J A Galiffe 1856. Supplement). 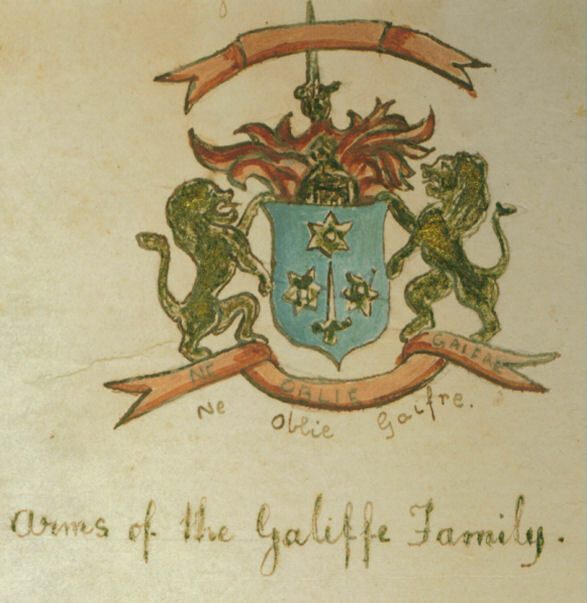 The Galiffe family have always exercised great care in the preservation of their parchments and documents. When the estate of Noble Louis Galiffe, Conseiller d'Etat, was administered in 1672, these papers, described as 'old titles and contracts' filled several large leather bags and it is mentioned that the deceased had them from his father, conseiller Jean Galiffe, who died in 1622, and that he held them from his grandfather etc; this collection, of a kind seldom referred to in the administration of estates of deceased individuals, at least in Geneva was with many other precious objects, pillaged, scattered and partly burnt in the revolutionary outrages of 1793, and 1794, when the Galiffe family, in the absence of its male members who had all emigrated and taken military service abroad, was only represented in Geneva by Melle Andrienne Galiffe, daughter of the late Syndic, Noble Jean Galiffe. However, a number of these deeds are still in existence and as they were numbered in chronological order it is possible to form an approximate idea of those which are missing*. *In this enumeration the marriage contract of No Pierre Galiffe and Suzanne de la Rive of 26th December 1687, is numbered 57. Up to that time there are many blanks which have been filled up as much as possible by fresh official extracts. Only a few papers of the XIV and XVth century are found, but several remain which are much more ancient referring to early marriages and some of them are very interesting apart from their importance as family records. Among these, and probably the oldest, was what the family called the 'Chronicle or genealogy', an old parchment of the end of the eleventh or the beginning of the twelfth century, in which a monk of the Abbaye de St. Oyens de Joux (St. Claude, in Jura) named Hunald, related to his kinsmen and especially to a nephew of his, in good Latin, the vicissitudes of the House, expelled from Salerne some twenty years before, by the conquests of the Normand Robert Guiscard (1075). In their flight or emigration, the last representatives of that branch had reached Burgundy who's Count was one of their relations, but not till they had sojourned some time in the North of Italy, notably at Ivrie, and at Saluces, where a gate called 'porta Gaifera' retained its name till the end of the last century*. This document which is mentioned in several inventories still existed till the end of the eighteenth century in the hands of Conseiller d'état Noble Barthelemy Galiffe, and it was during a mission to Paris (before the pillage of the Revolution) that the precious document was partly destroyed by the owner's mother, the widow of syndic No Jean Galiffe (nee Anne Rilliet) who naively used it for household purposes. The syndic had commemorated the principal events of the chronicle in 1758, by a gold medal bearing his arms suspended to the Prise Cup of the 'Exercise de l'Arquebuse, the most national of all our military Associations, of which he was the 'Segneur Commis' or President. The medal which is well known, is still represented on the Cup, and bears the motto: 'Nobles at Rome, Kings at Toulouse, Princes at Salerne, citizens at Geneva, ever loyal'. *Muletti, Storia di Saluzzo e du suoimarchesi, 1829. Since this mutilation which was completed by the vandalism of 1794, there only remained of the original document, besides the certain proofs that it had existed, fragmentary copies, relating to No Pierre Galiffe, allied to the de la Rives (1650-1733) the father of syndic Jean Galiffe, a very important beginning of a fac-simile, several substantial extracts, attempts at genealogical trees, etc. It is from these debris, scattered among various descendants, and from recollections of his father Conseiller d'état No Barthelemy Galiffe, that the more essential parts of the original have been reconstructed by our predecessor. In order to increase the intrinsic value of the work he made a careful study of the times, the countries, the persons and the facts referred to in the chronicle. As many of those did not figure in any printed History, and as several seemed to contradict events which were conventionally admitted, the author went and closeted himself for several months (1816-1817) with the archives of Salernes, especially those of the Benediction Convent of Santissima Trinita della Cava, the most important (bracketed with those of Mont Cassin and of Faria), for the historians of the Lombard dynasties of Southern Italy, expelled by the Franks and the Normands. It was there that J A Galiffe had to verify his notes and family traditions and he arrived with a letter of introduction from H E the Archbishop of Farenti, the liberal and learned Monsignor Capecelatro to whom he has been recommended by a mutual friend, Professor Cheneviere Senior. The Abbot of la Cava was then the Very Rev. Carlo Mazzacane who had been appointed under the old regime, under which he drew formerly an income of 34,000 ducats and kept open table daily for 100 poor, besides the hospitality which he had officially to offer to strangers. In 1817 the King of Naples had only conferred on the convent what had not been alienated under the French Regime, that is to say about a quarter of the former income. The convent had only been spared for the sake of its archives, which contained from 40 to 50 thousand Acts from the VIIIth to late in the XIVth century, all ticketed and numbered. This was the work of two famous archivists - Father Meinier whom Pope Urban (of the House Barberini) rewarded by giving him his own armorials and the hereditary title of Apost lic Protonotary - and Father Don Salvator Maria de Blasio who compiled the critico-diplomatic annals of the Kingdom of Naples in collaboration with Father Alexandro di Meo, one of the best authors in that line of work, if not for style and form, at least for the method, which is quite worthy of the modern documentary school. The Archivist at the time was Don Luigi Maricola who was then engaged on a glossary of Lombard Latin, for which Galiffe subsequently gave him a quantity of material. Galiffe was received most cordially by these two dignitaries of the convent who were delighted that a stranger, even a Protestant, set such a value on the records committed to their care. Having taken a lodging in the small ruined town of Corpo di Cava, named after the Convent, Galiffe set to work to decipher the old Lombard documents, a very difficult task as the characters varied according to the difficult task as the characters varied according to the different periods and localities. The enormous quantity of work that he managed to get through in a few weeks, at the rate of twelve hours a day reflects great credit on his learning and his astonishing aptitude. Some of the results of his researches appear in the second Volume of his 'Italy and its Inhabitants' 2 Vol Octavo T Murray, London 1820 - and in his 'Letters on the Middle Ages' addressed to the famous Councillor and Professor Schlosser of Heidelberg (author of the Heidelberger Yahrbucher 1839). Galiffe only set to work after depositing his family memoirs in the hands of the Abbot and of the Archivist, and after drawing their attention of the points which he wished to elucidate. He then invited them to examine and control the results of his search. These appeared so conclusive to the two dignitaries (and to other savants who studied them) that they offered to attest them and to have them authenticated free of cost. So much for the explanation of what can only be described as tradition, at least among the public of Geneva, and now we pass to the more immediate antecedents of the family prior to establishing itself in Geneva in the XVth century*. *The travelling companions of Galiffe from Naples to Salerne, and to la Cava, were Mr & Mme Favre-Bertrand, Simonde de Sismondi, and especially Mr Nightingale, father of the famous Florence Nightingale so well known by her work in the Crimean War. Here follow two letters from the Abbot Mazzacane to J A Galiffe, dated 16th & 20th May 1817, one in Italian and one in French, both congratulating him on his erudition, and on the result of his researches, but otherwise of no particular importance (Translator). The family archives of that period are easily controlled and the occasional blanks are filled up by the accidental discoveries of other colleagues, or by more recent publications of our historical 'Societies'. A very natural question is weather the Galiffes of Geneva and the de Galiffets of France which all resided during the XVth century in the province called 'Genevois' are of the same origin, and if so which of the two families has retained the true or at least the more ancient orthography? This much is certain - notwithstanding that difference, three successive generations had the same Christian names, Jean, Jacques and Amedee and resided in the same localities in Savoy, and at least for one of these generations and localities there is no possibility of a doubt, as the proofs of these antecedents come from different sources which the respective families had no opportunity of communicating to each other. This is explained by the fact that for three and a half centuries these families were widely divided, one being republican and protestant, the other royalist and catholic, and were only connected with Geneva by one event, the 'Escalade' in 1602, when one of the de Galiffets figures among the Savoyards Noblemen captured, hanged and decapitated, while the Galiffes were fighting for the Genevese fatherland. As regards evidence anterior to the XVIth century, so far as the French family is concerned, since its title deeds were destroyed in the troubles of the 'League' and the burning of the archives of the Parliament of Grenoble, it rests only on the semi-official researches of experts such as d'Hozier, de Courcells, Borel d'Hauterive and others in connection with confirmation and acknowledgement of certain rights, such as the acquisition of the principality of Martigues by one of the de Galiffets towards the end of the XVIIIth century. From these researches, mentioned in the last edition of d'Hozier and published in full by Didote, it is established that the antiquity of this family goes back to a remote period, but that its origin is unknown; that two of its representatives were members of the 'Etats du Dauphine' in 1347, but that the continuous filiation begins only at the end of the XIVth century, both in Genevois and Dauphine, and that since then it is based on documents filed in the 'Chambre des Comptes' of Turin. The Genevese family on the other hand appears to have attached but little importance to its mediaeval pretensions beyond the traditions above referred to, but they are supported by authentic documents partly preserved to this day, and by publications of our learned societies. All these sources concur in proving that the Geneva branch is correct as to the orthography of the name, so far as the three generations of the XVth century are concerned which all signed the same way and probably also as regards its predecessors in the Dauphine, as the only mention of the name is that of Noble Aymar Galiffe (Eymarus Galiffi) which occurs in 1334 among other owners of 'fiefs' who had to render homage to the Dauphin. (Inventaire des Archives du Viennois published in 1871 by the Abbe Ulysse Chevalier, No 24, pages 49-50). From this it may be presumed that the final 't' was an incorrect substitution for another letter (r for instance) which may have been there formerly, or that it was an unconscious concession to the meridional pronunciation dating from the establishment of the family in Provence. 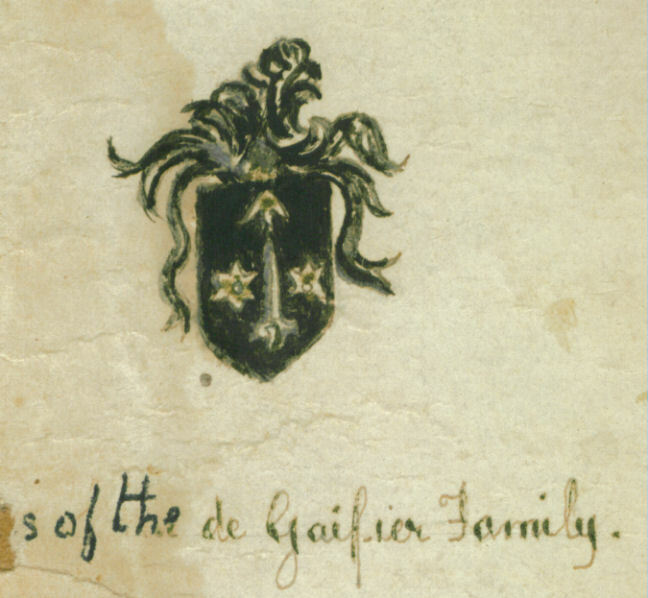 In stating that it is under the name of de Galliffet that its representatives 'have during the last three centuries filled the highest posts in the Magistrature, and the superior grades in the Army and Navy, and received their principal titles of nobility', the French historians have only followed the usual custom of using uniformly the name under which the family has more particularly distinguished itself. It must be admitted however that it is that name and not Galiffe without the 't' which was better known from the XVth century in Savoy, and especially in the adjacent districts of Dauphine where it still exists. As we are only concerned here with the Geneva family, we shall be careful to separate in the three generations described by our predecessor, his own version from those given in printed genealogies which were unknown to him. Arms:- 'd'azur a l epee d'argent posee en bal, garde et poignee d'or, accompagnee de 3 molettes d'eperon d'or, 2 en flanc, la troisieme en chef'. Cimier:- 'une main armee tenant une epee d'argent posee en pal sur le casque ouvert de face, et comme pour l'enfoncer du pommeau, garde et poignee d'or'. Cri:- 'Je suis Waifre, ou Waiferius sum'. Shield:- 'On a blue ground, a silver sword with gold hilt, 3 spur-rowels, one on each side and one above'. Crest:- 'a mailed hand holding a silver dagger with gold handle resting on open-vizored helmet'. Device:- 'Do not forget Gaifre'. 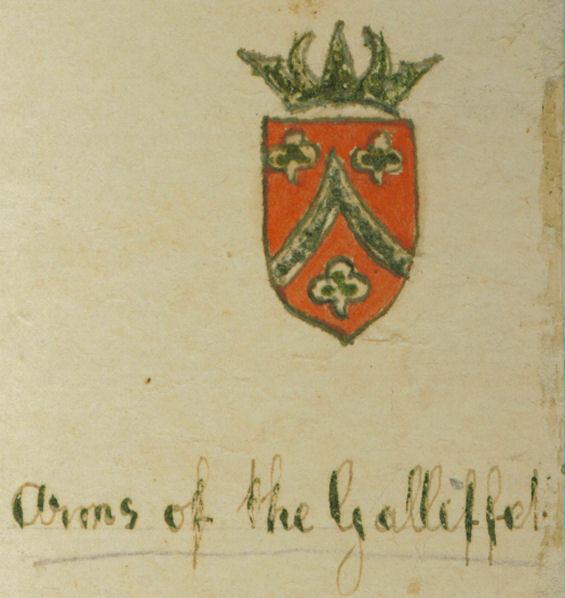 These arms appear on the Seal of the first Galiffe admitted to the bourgeoisie of Geneva with his initials F. G. (1491-1520). 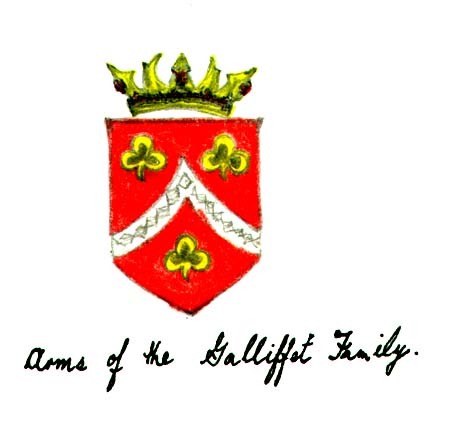 The above Arms are of the de Gaifier and de Gallifet Family. 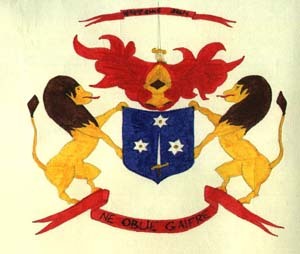 The arms of the Galiffe family are exactly the same as those of the Viscounts de Debuisson, Lords of la Cave in Burgundy, except that they have inlet a golden balance on red ground. The de Gaifier (von Gaifier) received in German nobility 'in consideration' of their antiquity and distinguished 'alliances' have the same shield, but on black ground and sometimes the top rowel is replaced by a spear-head, but without support, battle-cry or device and the crest is sable plumes. The heraldic record of bonacini of Milan, gives to the Galiffe very different arms, viz. blue shield with silver band across, and a dove holding an olive branch, on left an arm holding a silver sword with gold hilt piercing 2 crowns : above a gold scroll with the motto 'Gloria et honor solide'. It is quite possible however that these arms may have been imagined, as several others in the same book undoubtedly were. Finally the counts and marquesses of Galliffet in France bear different arms, viz. red ground with silver chevron and three gold trefoils. Jaques de Galliffet the representative of the second generation in Savoy is supposed to have caused these arms to be carved above the door of the apartment which he occupied in the Castle of Voyron in Dauphine which he commanded in 1428, and according to the report of a search made in 1730 the shield was still in existence then. It may just as well however have represented the arms of a predecessor or a successor of the said Jaques, or may have been the arms of an allied family or of the Lord of the Manor. 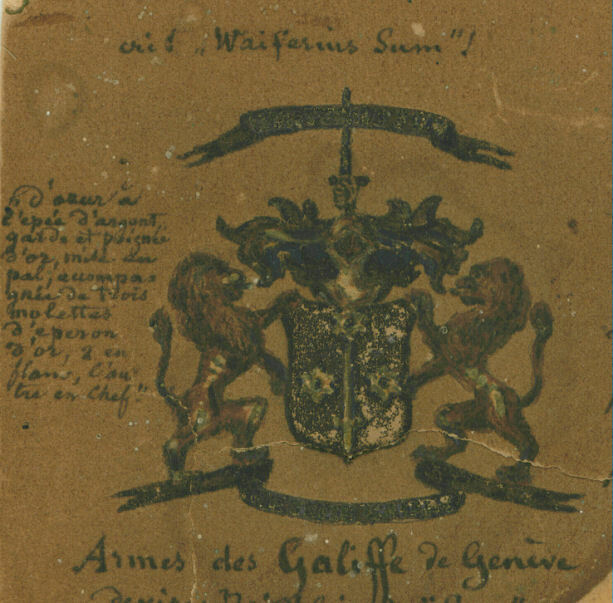 A characteristic fact in the genealogy of the Galiffe of Geneva is that (with the exception of a small ramification described as 'of St. Gervais' which became extinct very early) the family was perpetuated for four centuries by one single male in each generation, whatever was the number of daughters. This was a great disadvantage, first as regards obtaining high positions in the state owing to the want of support of collateral male relatives, and also as regards maintaining the style demanded by these far from lucrative employments without pecuniary assistance of commercial or industrial enterprises. Notwithstanding this drawback, the family entered the CC (Council of 200) in the second generation (1555) and later was represented in the Council d'Etat (the Executive Council) from 1690 until the Revolution of 1790 which dispersed and ruined the family so far at least as its previous high position was concerned. From their first arrival in Geneva (1491) the Galiffe had for three centuries contracted alliances with the best family all indigenous, except in one case (the noble Humbert of Dijon). Besides contributing many well-known men to the higher magistracy and the bar several members of the family distinguished themselves on foreign military service. It is only in the XIXth century that some of its representatives adopted literature and science as their profession. Others again are remembered by their connection with the 'Noble jeu de l'arquebuse' to which we will refer in a note. For the first three degrees of affiliation we shall utilize concurrently the old Savoyard and Genevese family traditions corroborated by existing documents, and also those given in the printed genealogies of the de Galiffet family - but the latter will only be mentioned between parentheses : the concordance between them rests on facts which may differ but are never contradictory.